Experience your city from a different point of view. 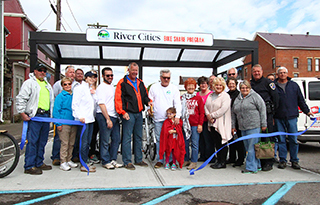 The River Cities Bike Share Program is a great way to get around downtown areas of Aurora and Lawrenceburg, and along the six-mile stretch of the Dearborn Trail. Get out, get pedaling, and have some fun! 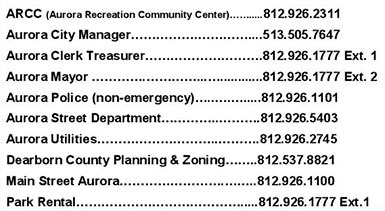 or the City Manager: 513-505-7647. Renting a River Cities Bike Share bicycle is designed with simplicity in mind. Just download the MOVATIC App to your Apple or Android device. Using the App, locate the kiosk you wish to rent from and unlock your bike. When your finished riding simply return to the kiosk you rented from and use the app to lock the bike back in. That's it. FIRST! Download the new 2018 MOVATIC App to get started. Looks like a bike chain. You must have an iOS or Android Smartphone. The Movatic App will need location and Bluetooth turned on within the smartphone to operate. *App has a Retry Button option feature to give another 10 second window if unable to remove bike. **Bikes will show RENT as available. If app shows NOT IN RANGE then the bicycle is unavailable to rent. If unable to rent then hit Cancel Button and retry renting another bicycle. RIDE: Enjoy bikes from 8 am to dusk daily. Wooooo hooooo! RETURN: Bikes must be returned to the station you rented from. Position bicycle with electronic receiver over the pin on the rack. Bike will automatically lock to rack. To STOP RENTAL FEES you must go into the Movatic App and END THE RENTAL. This icon is in the top right corner of the screen app in red. Select End the Rental and follow the prompts. I have questions. Is there someone who can someone assist me with the Movatic App? Yes. 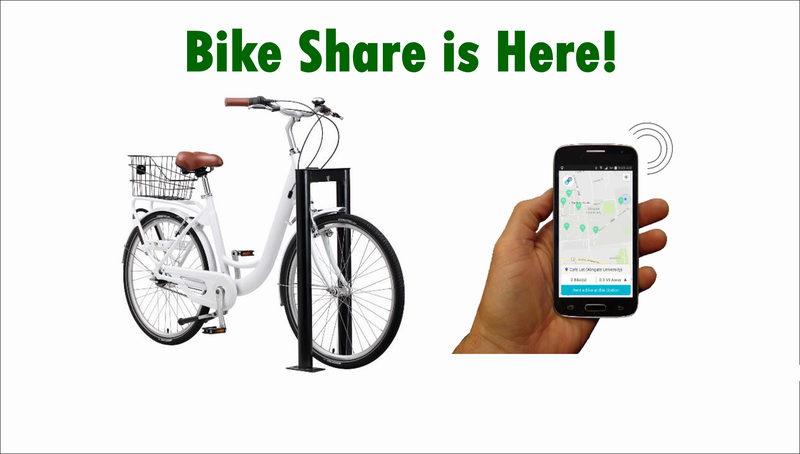 Contact 812-290-1070 or 812-584-1092 for assistance with the Movatic App, on site Bike Station questions, accessibility or rental charges. If no answer then a River Cities Bike Share Program representative will return your call ASAP. For more information please visit the rivercitiesbikeshare.com or aurora.in.us. What does it cost to rent a bicycle? $3.00 the first hour and $2.00 each additional hour. Can I pay with a debit card or prepaid credit card? No. Only a credit card will work in the app. User may input two or more credit cards to use within the app. Debit Cards or Prepaid Credit Cards will not work. How many bicycles can I rent at one time? Only 2 bicycles may be rented at one time via the Movatic App smartphone user. Individual responsible for rentals must fill out a User Agreement for the individual bicycles in the Movatic App. BY CHECKING THE BOX, RIDER AGREES THAT RIDER HAS READ, UNDERSTANDS AND EXPRESSLY AGREES TO THE RELEASE AND WAIVER AGREEMENT AND TERMS AND CONDITIONS. My Bike did not Un-lock. What do I do? Go into the Movatic App and END THE RENTAL. It may be that the 10 second window passed without the bicycle being removed from the lock. Start the rental process again. TIPS: Stand within arm’s reach of the bicycle rack. Ensure the kick stand is lifted. Listen for the lock release click. Pull the bicycle back from bike rack within 10 seconds. If I am unable to rent a bicycle, how will I know that I haven’t been charged a fee on my credit card? A River Cities Bike Share Program representative will pursue a credit card refund to the user identified with the rental if there was a problem with the bicycle not unlocking or mechanical failure. Individuals will be charged if they fail to return the bicycle to the original bike station or fail to End the Rental in the Movatic App. A text or email prompt with connect to the user to remind him/her to process the End the Rental after 2 hours. How do I End the Rental when I return the bicycle? In the Movatic App there is a red icon in the top right corner. This feature will prompt you to End the Rental. Make sure to select the correct bike station to return the rental to and Report a Problem if necessary. Once the End the Rental process is complete then the bicycle may be rented again. Rental charges will continue until the bicycle is returned to the bike station and End the Rental is finished in the Movatic App. In the Movatic App there is a Report a Problem icon for reporting issues with the rental bicycle process, inability to unlock a bicycle or to report maintenance issues with the bicycle. Individual rental history details are available through the Movatic Administrative website for review. A River Cities Bike Share Program representative will work with bike renters to resolve issues. Can I return the Bicycle to any station? No. The River Cites Bike Share Program is a Ride & Return system. The Movatic App is GPS based and will prompt user to address the station the bicycle is returned to. 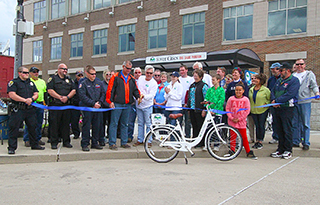 Because all stations are relatively close – please make sure the bicycle is returned in the app to the Downtown Aurora, Dearborn Trail- Aurora Dog Park or Downtown Lawrenceburg station correctly. This ensures the user doesn’t have continuous rental fees after bicycle is returned. Why do I have to return the bicycle to the station I rented it from? 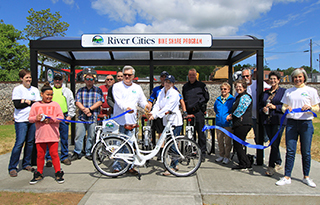 The River Cities Bike Share Program features a Ride & Return policy to facilitate the bicycle inventory. If you were able to return the bicycle to any station then the shelters would need to be larger, each station would need more bicycle racks and staff would need to travel through two cities to return the bicycles. This leads to higher program costs. Each bicycle has a number linked to their home station. There are also two cities maintaining the Bike Share Program. The Movatic App will prompt the user to identify which station the bicycle is returned to. Downtown Aurora, Dearborn Trail (at the Aurora Dog Park) or Downtown Lawrenceburg. If the bicycle isn’t returned to the original station then the app will not show the bicycle returned. This may create additional charges. Individuals are responsible for bike rental fee, damage or replacement Bicycle fee per the User Agreement.Please return the rental bicycle to the station where it was rented from and select End the Rental in the app to avoid incidental charges. Thank you for choosing the River Cities Bike Share Program. Have Fun and Let’s Ride! !